If you live in an area that has a low humidity level, then you might need to use a humidifier in your home. An ultrasonic humidifier is a type of humidifier that produces a fine mist of water through a high frequency vibration. They are becoming more popular in homes because they are quieter than many hot water humidifiers, and they tend to be safer in homes with small children. These devices can have disadvantages like making you more susceptible to harmful pollutants, so it is best to know which features are important considerations with any model. After doing a lot of research on the topic, we have made a list of three of the best ultrasonic humidifiers available. Our list also includes a budget friendly option for your consideration. Pure Enrichment is a leading manufacturer of products that are designed to improve your home, your health, and your overall well-being. All of their products are held to the highest standards, so it is no surprise that one of their ultrasonic humidifiers would be on our list. The Pure Enrichment Ultra Sonic Cool Mist Humidifier is a top of the line device that is essentially everything you would look for in a good humidifier, and that is why it is the gold pick on our best of list. Anyone who suffers from frequent cold and flu symptoms or allergies should consider using an ultrasonic humidifier in your home. This cool mist humidifier is a device that will help treat these symptoms as well as those caused from asthma. It provides extra moisture in your home, which will decrease the static electricity present in the air. It is also a great way to keep your skin from becoming cracked and dry during the harsh winter months. This tabletop humidifier is powerful enough to moisturize and improve the air in any 250 square foot room, which means that it is more than adequate for almost any bedroom, office space, or other medium sized area. The Pure Enrichment Humidifier is only eight inches in length by five inches in width by nine inches in height, so it will easily fit on any small surface. It also has an aesthetically pleasing design that will fit in with the décor of any home or office. This model features a 360 degree nozzle, which allows the device to mist wherever you find most comfortable. You can also choose between two different speed settings, which gives you to power to control the amount of mist you are putting into the air in each room. It is also an extremely quiet device that is designed to help you get a night of relaxation, not hinder your sleep because it is loud and obnoxious. This humidifier comes complete with a tank that holds one and a half liters of water at one time, so it will be able to run continuously for a long period of time. In fact, when the humidifier is placed on the low setting, it is likely to provide you with at least 16 hours of air quality improvement. The Pure Enrichment Humidifier is capable of releasing 150 milliliters of moisture each hour, which is ideal for reducing any symptoms that you may be experiencing from breathing in dry air. Since the humidifier can be utilized for 16 hours straight, you will be able to experience a restful night of sleep without needing to work about the air quality or the safety of your family because you decide to keep the device running all night. In addition, this humidifier has safety features to ensure that nothing goes wrong during the night while you are sleeping. It also utilizes cool mist technology, which means that if it is knocked over for some reason that burns will not occur. One of the safety features that come standard on this humidifier is the automatic safety shut off, which turns the humidifier off when the water level goes below a certain point. It also turns the device off when the water tank is removed. This is a great safety feature, especially if you are trying to fill the tank in a hurry. As an added bonus, this humidifier has an optional night light that provides a soothing glow as you are falling to sleep. It is also a great feature for a child who may not be comfortable in a dark room. This humidifier can be purchased on Amazon for about $50, and it comes with a two year warranty. Considering the benefits a humidifier can have on your health, this is an extremely reasonable purchase that many have decided to make. TaoTronics is a company that has been providing us with small home accessories that are built to be dependable and enhanced to make our lives easier. Humidifiers are often needed in our homes, and Taotronics has stepped up to bring us top of the line options to improve the quality of the air we breathe. This company is the manufacturer of our silver pick on this list, which is the TaoTronics Ultrasonic Humidifier Cool Mist. As the name implies, this device is an ultrasonic humidifier that creates a cool mist that adds humidity to the air. It features a silent motor that ensures that you will not be disturbed while you are sleeping or enjoying a little evening television. The humidifier is only a little over three pounds, so it is lightweight and easy to move to another location. It features an aesthetically pleasing blue and white design that is perfect for adding moisture to any room that does not exceed 538 square feet. The TaoTronics Humidifier features a micro-porous cartridge that is used to filter the water before it is introduced into the air in your home. This system is designed to remove micro-organisms from the air as well as other minerals that are present in the air we breathe. Removing these aspects from the mist transforms the air in your home into a healthier compound. This model comes complete with a four quart tank, which is the equivalent of one gallon. It is capable of working continuously through the night; up to 15 hours utilizing the water from only one tank. Since many like to use a humidifier while they sleep, this device comes with a night light that can be used to help make your way to the kitchen to get a drink, or it can be turned off to provide you with a dark and silent night. This humidifier features an LED display that shows you the current humidity levels and allows you to adjust them to your liking. You can also adjust the mist to three levels of comfort. It is dispersed from a 360 degree nozzle that can also be adjusted to create a better flow of moisture in the room. This device has a timer that can be set to keep the humidity level at a certain level, which can be set for up to 24 hours at a time. It also has a safety feature that will automatically turn the device off if the water level becomes too low. The purchase of this humidifier comes with a two year manufacturer’s warranty, which means that the company backs this product. This humidifier can be purchased on Amazon right now for an amazing price of only $80. When it comes to humidifiers, PuraSense brings an aesthetically pleasing look to the table. The PuraSense Ultrasonic Humidifier Mist Diffuser is our bronze pick, which features a simple tear drop shape. Its design is compatible with any décor, and the nightlight can be switched between five different LED color options, which are teal, green, blue, pink, and yellow. In addition, the night light feature can be turned off if you prefer to sleep in the dark. Going past the aesthetics of this humidifier, the PuraSense Mist Diffuser is great when it comes to diffusing mist into the air. It is capable of adjusting the humidity level in any room up to 538 square feet, which means it is great for most bedrooms and offices. It is designed to utilize ultra quiet technology that will add humidity to a room without making excessive noise. In fact, it is so silent, that it is hard to pick up any sound at all, even when you are standing right next to the device. This humidifier has a 1.3 liter capacity, which is a bit less than some of the others on this list. The PuraSense Ultrasonic Humidifier is still capable of running continuously, but it may not last quite as long. It will usually run for about seven hours before the automatic shut of safety engages because the water level is low. Micro-porous filters are utilized in this device to filter the air from unwanted microorganisms as well as negative ions. The mist released into the air will be cleaner, which means it will be healthier for you to breathe in as well. The humidity levels can be set and controlled to a level that you prefer, and the mist can be adjusted to your liking as well. The mist is released from a 360 degree nozzle that rotates or it can be set to one position. There is also a knob on the front of the humidifier that gives you complete control over how much mist is being released into the air at any given time. When it comes to reviews, this humidifier has quite a few on Amazon. 66 percent of those who reviewed it gave this humidifier a five star rating and another 19 percent gave it a four star rating, which means that 85 percent of the reviewers were pleased with their purchase of the PuraSense Humidifier. One Amazon user gave a testimonial about the quality of the product as well as the customer service provided to them saying: “I love this humidifier! It is very quiet, which is perfect for light sleepers. You can barely hear a thing and it does not produce the annoying splashing water sound that others make. The size is perfect and the amount of humidity that it creates helps me a great deal with my sinusitis and dry eye problem. I really feel the difference! Also, the design is very cool! Another two features worth mentioning is that is does not beep at all and that you can very easily move just the top part (and not the whole thing) to direct the humidity wherever you want. Finally, they have an outstanding, brilliant customer service. I contacted them with an issue and they got it solved in no time and totally hassle-free.” This humidifier can be purchased on Amazon for about $45, which is great considering that you also get a lifetime warranty with the purchase. If you are new to using humidifiers in your home, you may wish to try one out before you commit to a humidifier that has a higher price tag. 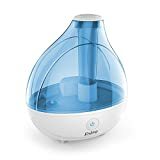 Our ballin’ on a budget option is the PureGuardian H1010 14-Hour Ultrasonic Cool Mist Humidifier, and it is a great option that has a lower price point without sacrificing quality or power. This humidifier is a great lightweight option that is perfect for any room that is less than 125 square feet, which is admittedly a bit less space than our previous picks, but it is perfect for small rooms. This device weighs in at less than two pounds, which means that it can easily be transferred from room to room, or if you need, you can take it on vacation with you and set it up in your hotel room. It features a compact, disc-like shape that can conveniently fit into any suitcase. That design is also one of the more unique aspects of this humidifier. It is blue and white with an aesthetically pleasing design that will add flavor to a room’s décor. PureGuardian has included Silver Clean Technology to the H1010, which is an advanced system that inhibits the growth of mildew and mold. This technology means that less cleaning and maintenance are required to emit a clean and healthier mist. No filters are used with this system, so that is one less thing you will need to clean. The PureGuardian H1010 is a device that utilizes near silent humidifying technology, which means that there will be no chance that using this humidifier will keep you awake at night. It features a 0.21 gallon tank that will keep the humidifier running continuously for about 14 hours. That is long enough to keep the machine running through the night. If by chance the water does become low while you are asleep, then the safety system will kick in and automatically turn off the device when the level becomes too low. A red indicator light will become visible when the water needs to be refilled. The mist can be controlled easily with the knob on the front of the device. In addition, the mist nozzle can rotate a full 360 degrees, so you can aim the mist wherever you like. This humidifier is also equipped with a night light that will soothe a young child to sleep. The size of this humidifier makes it perfect for a small child’s room, and the cool mist technology will assure that your child is safe if the device gets knocked over. In addition, this humidifier can be purchased in baby blue and pink with nursery decals if you do want it for your little one’s room. The PureGuardian H1010 can be purchased for about $25 on Amazon, and it comes with a three year manufacturer’s warranty. 77 percent of the Amazon users who reviewed this product, gave it a four star rating or better, which means that majority of them were ecstatic with their purchase. The size of the room you need the humidifier for will be a deciding factor in the size of the humidifier you need to buy. Tabletop humidifiers are great for small and medium sized rooms that are less than 500 square feet. You can also buy larger humidifier for areas that are less than 1,000 square feet. These will be placed on the floor, but they are still easy to move around and maneuver when you need. The largest available humidifiers are for rooms that are over 1,000 square feet. To accommodate that size of a room, they will need to be set in a stable location. These extra large humidifiers are typically not easy to move from place to place. Make sure to measure the room you will be using the humidifier in before deciding which one you want to purchase. Some humidifiers have an extremely loud method of dispersing a cool mist into the air in the room. Nothing is more annoying than a noisy humidifier that keeps you up at night, so make sure that the one you choose utilizes an ultra quiet technology. This will allow you and your family to sleep through the night without any extra white noise being present in the room. A humidistat is a feature that many humidifiers have that allows you to set the device to automatically shut down at certain humidity levels. This is a great feature that allows you to set a room to have a certain humidity level and easily keep it at that level. Some humidifiers also have a timer function, which allows you to set the humidifier to come on at a certain time of day. This means that you can have your bedroom at the humidity level you desire before you enter the room to go to sleep for the night. Make sure to consider other features that you will want in a humidifier as well. How much time are you willing to spend cleaning a humidifier? You need to assure that the mist you are adding into the air is as clean as possible. Using hard water in a humidifier can result in mineral buildup on the filter. IF you prefer minimal cleanup, then you may want to consider a humidifier that has no filter or extra parts to clean. Some humidifiers allow you the convenience of adjusting the mist flow to your liking, and with some, you can also adjust which direction the mist is dispersed from. Make sure the humidifier you select has all of the convenient controls you desire before you decide on one. The display of the front of the humidifier is important, as it can tell you the temperature and humidity levels at a glance. If you are using this humidifier in a small child’s room, it may be a great idea to have a nightlight capability. You may also want to be able to turn the nightlight off when desired, so make sure you can have some control over it. Also make sure the hue of the night light is appropriate, you do not want a bright light that will hinder your sleep. Humidifiers are used in areas where the air is abnormally dry. This low level of humidity can cause dry skin, sinus issues, a dry throat, or severe allergies, but controlling the humidity level in the room can help a great deal. Measure the area that you will be using the humidifier in, and then decide which features you need. Take a look at our pick, and decide which ultrasonic humidifier is best for you and your family.